View of the Pultney Bridge in Bath, designed by Robert Adam and constructed between 1769 and 1774. It was designed in the then-fashionable Palladian style and has an Italian influence (with some marked similarities to the Rialto Bridge in Venice). 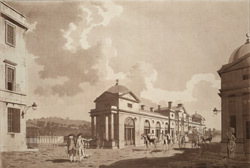 In this print the bridge is not heavily built-on but today it is lined with shops. Pedestrians crossing it can no longer see the River Avon and many have no idea that it is a bridge.